Conjunction Conundrum: When Will Venus & Jupiter Be Closest Together? 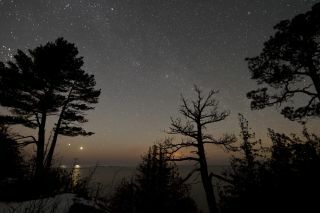 This week Venus and Jupiter, the two brightest planets in the sky, are making for an inspiring sight, drawing all eyes toward the western sky as night falls and outshining all the true stars in the sky. Tonight (March 13), Jupiter shines to Venus' lower left. The planets will make a spectacular conjunction, shining just a few finger-widths apart, with Venus appearing a bit higher than Jupiter. Here at SPACE.com we've been indicating that Venus and Jupiter will be closest together this evening. But this may puzzle some who might have read in other astronomical publications, such as the Observer's Handbook of the Royal Astronomical Society of Canada, that the actual conjunction between these two brilliant planets will not take place until two days from now (March 15 at 10:00 Universal Time). What is the reason for this discrepancy? Could we be wrong? Could those publications stating that Venus and Jupiter are in conjunction on Thursday somehow be in error? Actually, both March 13 and March 15 are correct! The explanation is simply that two different meanings of the word "conjunction" are in use. The Observer's Handbook gives the date and time when the two planets have the same right ascension (the equivalent of longitude on the night sky). But while the dates differ, both we and the Observer's Handbook state that at their closest, Venus and Jupiter will be separated by exactly the same value, namely 3 degrees. So is there really a difference? The Handbook derives its data directly from the U.S. Naval Observatory's Astronomical Almanac, whose calculations concerning conjunctions are "geocentric"— that is, based on an observer's perspective as seen from the center of the Earth. But as viewed from other parts of our globe, an effect called parallax comes into play, making the objects in question appear either closer together or farther apart. In the case of Venus and Jupiter, North Americans will see these planets 3 degrees apart tonight (the moment of closest approach, occurring around 6 p.m. EDT). On Wednesday (March 14), they will appear practically as close, separated by 3.1 degrees. But by Thursday, the gap between the two will have noticeably widened to 3.5 degrees. So for all intents and purposes, tonight is the night that the "dynamic duo" will be at their absolute closest to each other. They'll be ever-so-slightly farther apart tomorrow night, and by Thursday, it will be obvious that the Goddess of Beauty and the King of the Gods will be heading their own separate ways.